Vintage Bowser Petrol Pumps for the 1920s garage. Homepage. 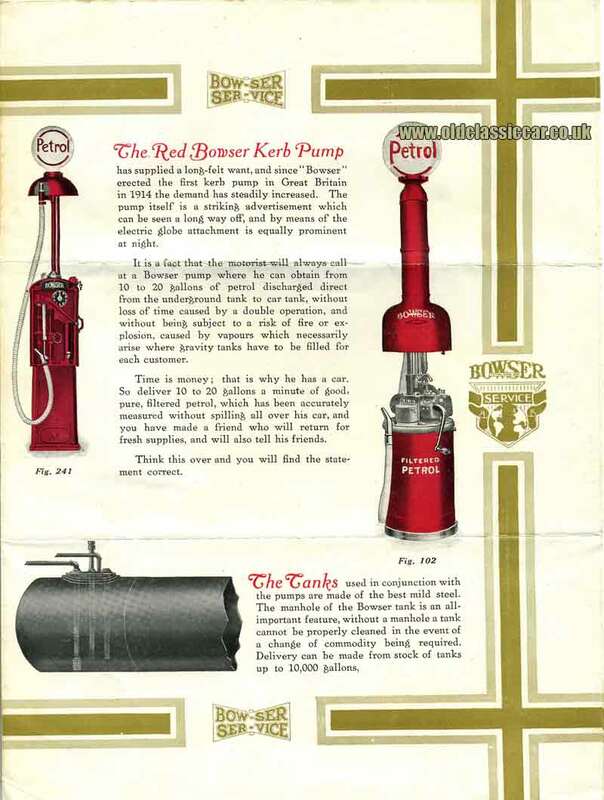 This page: Bowser petrol pumps brochure from 1922. "The Bowser Underground Petrol Storage Systems hold the premier position throughout the world. Thirty-six years experience have embodied superiority, safety, best workmanship and economy. ORIGINAL PATENTEES of the piston-type measuring pump, both kerbside and indoor, and first introduced into this country by them. Bowser's always LEAD the way to ADVANCEMENT. First in Great Britain to gain the approval of the Board of Trade. 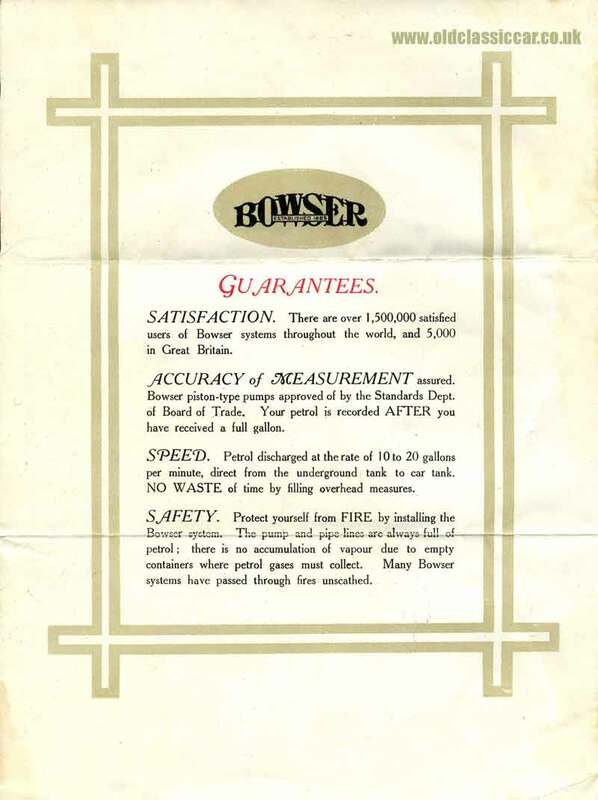 The first full page tells the garage-owner that there were over 1,500,000 satisfied users of Bowser fuel systems throughout the world, 5,000 of which were here in Great Britain. Accuracy of the measuring devices was also guaranteed, and fully approved by the Government's Standards Dept. Petrol would be discharged at a rate of 10 to 20 gallons per minute, direct from the underground tank, and into the motorcar. One safety feature incorporated within the Bowser petrol pumps was the reassurance that both the pump and pipe lines were always full of fuel - therefore reducing the risk of flammable vapour building up in empty spaces. "Good petrol service to the motor owner must be studied by every garage proprietor in these days of competition; the man who obtains fresh clients each day can only do so by gaining their CONFIDENCE. Without that confidence there is always an unwarrantable suspicion on the character of the seller, and it robs the buyer of that sense of satisfaction so necessary to the garage trade. The name Bowser on piston-type measuring pumps is the mark of confidence and good service. This hall-mark of quality enables us to enjoy the premier position throughout the world today. 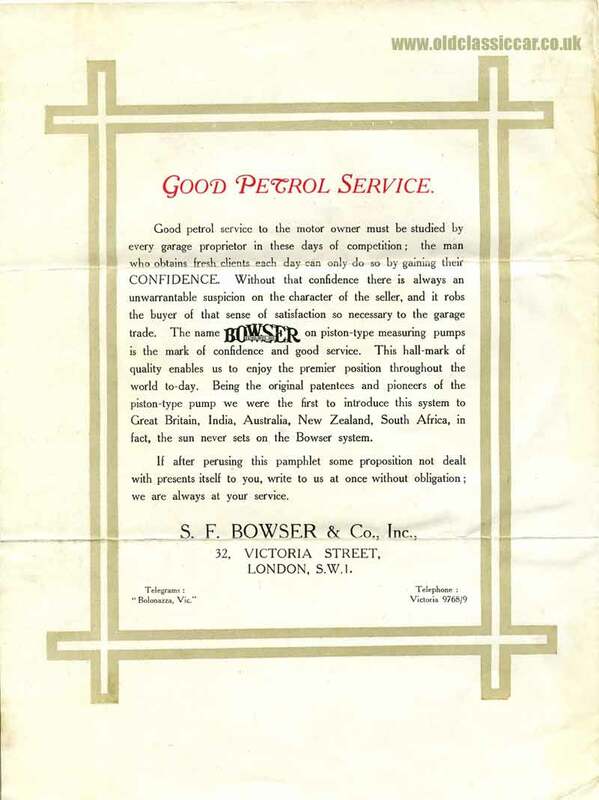 Being the original patentees and pioneers of the piston-type pump we were the first to introduce this system to Great Britain, India, Australia, New Zealand, South Africa, in fact the sun never sets on the Bowser system. If after perusing this pamphlet some proposition not dealt with presents itself to you, write to us at once without obligation; we are always at your service. S.F. Bowser & Co. Inc., 32 Victoria Street, London SW1." The brochure now folds out, displaying the various pumps that were available. First up are two pumps that are suitable for the garage "where a kerb pump is not permissible, or to the large commercial garage where rapidity of filling combined with accuracy is essential. The petrol is pumped direct to the motor from the underground tank ...... You do not need a book-keeper; the meter will tell you exactly what has been drawn out, and when not in use the pump can be securely locked by the simple means of pressing a button." Neither of these petrol pumps have illuminated globes on the top. If the garage owner wanted a distinctive illuminated pump, the Red Bowser Kerb Pump was the tool for the job (shown alongside): " ... The pump itself is a striking advertisement which can be seen a long way off, and by means of the electric globe attachment is equally prominent at night .... Time is money; that is why he has a car. So deliver 10 to 20 gallons a minute of good, pure, filtered petrol, which has been accurately measured without spilling all over his car, and you have made a new friend who will return for fresh supplies, and will also tell his friends. Think this over amd you will find the statement correct." 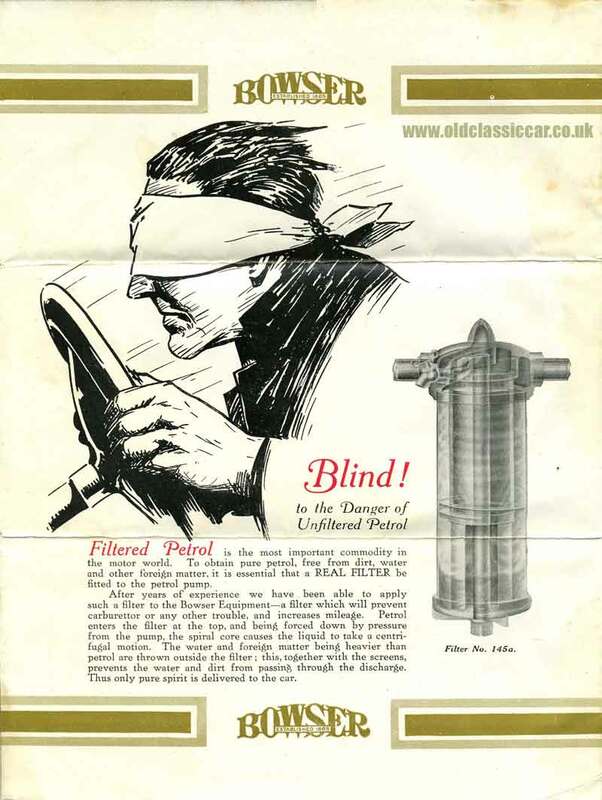 Great play is also made over the accurate filtering of petroleum motor spirit: "After years of experience, we have been able to apply such a filter to the Bowser equipment - a filter which will prevent carburettor or any other trouble, and increases mileage .... Thus only pure spirit is delivered to the car." Surviving petrol pumps of this type are rarely spotted in their original locations nowadays. I know of one similar kerbside pump, from either the 1920s or 1930s, similar to that shown above which is only 10 miles or so from here. This one was photographed in 2005 and fortunately is being preserved. Due to their shape they are referred to as the Fat Boy petrol pump, amongst collectors for these interesting gasoline and petrol pumps. The glass globes that were a feature of petrol pumps right into the 1970s are also keenly sought. This garage photograph, taken in the 1930s and featured in the period photographs section, has a selection of pumps and globes visible, similar to those that Bowser would have supplied. 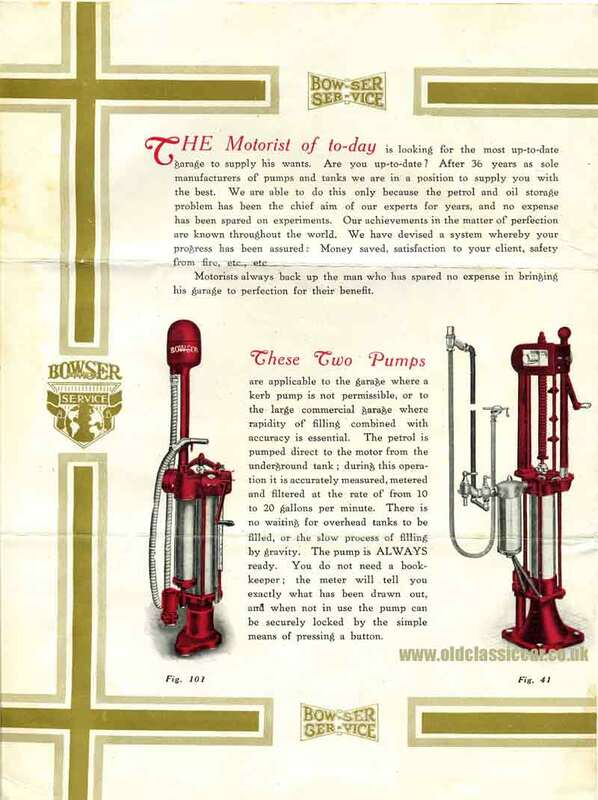 Another well known supplier of pumps was Avery Hardoll, and in 2012 I was fortunate enough to acquire a copy of their 1950s leaflets, which can now be found on this page. Prior to the introduction of the roadside and garage pump, owners of motorcars relied on fuel supplies being delivered in 2 gallon cans, direct from the fuel producers. These 2 gallon fuel tins are also keenly collected today! An article discussing the subject of collecting petrol & oil memorabilia can be found on the petroliana page. Photographs of older garages, that may have once had one or more vintage petrol pumps outside serving fuel, can be seen on the old garages page.